January Members of CACCP are interviewed by Ken Timmerman for the American Spectator magazine. See some pictures here. CACCP Open Letter to Jeb Bush, Governor of Florida . (17) Three week Chinese New Year celebration begins at Florida Splendid China. 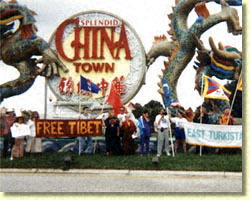 Jack Churchward, left, Ablajan Laylinaman, and J.J. Wilson, right, protest outside Florida Splendid China in Kissimmee. 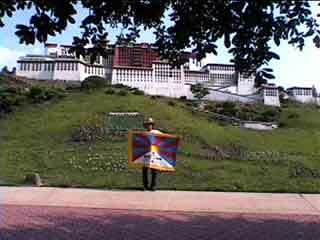 The protesters oppose the use of exhibits from Tibet, Eastern Turkestan and Mongolia at the 76-acre theme park. May (1) Protest Demonstration to Commemorate 52nd anniversary of takeover of Inner Mongolia. Is Florida Splendid China being sold ? 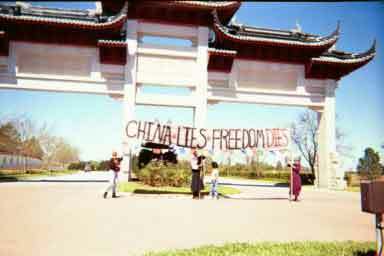 (15-16) "Exposing Communist Chinese Influence in America" conference held in Orlando. 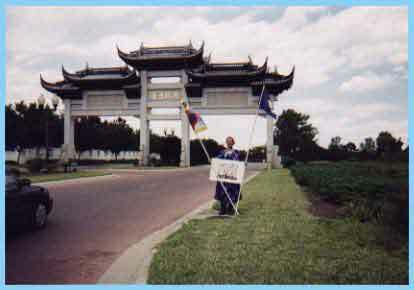 (16) Protest demonstration at Florida Splendid China ! Read about the demonstration ! (22)Florida Splendid China Acrobats attend 3rd Asian Heritage Festival ! June (5) Protest demonstration to commemorate the 10th Anniversary of TianAnMen. Here is a link to CND's Virtual Museum to the memory of those brave people. September Response to ETNFC letter from Pinellas County Schools Superintendent J. Howard Hinesley. Our principles are aware of the controversy surrounding the site. Thank you again for your interest and concern. 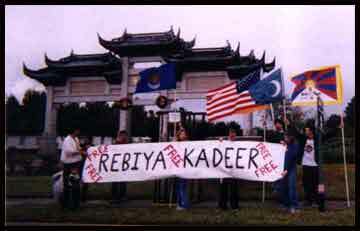 (10) Protest demonstration to commemorate the 50th Anniversary of the takeover of Eastern Turkestan. 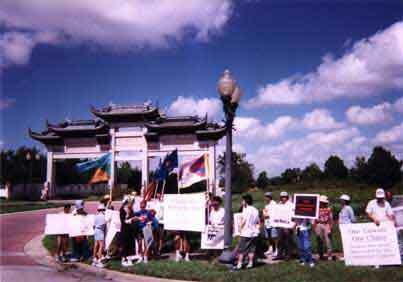 (18) Protest demonstration to commemorate the 6th Anniversary of the opening of Florida Splendid China. In the Red ? How is Splendid China faring ? Letters to the Editor Something Splendid - Al Riley responds to article on December 20, 1999. 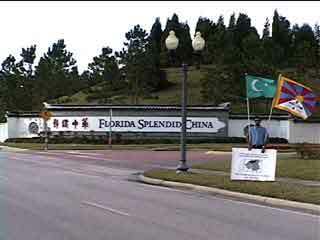 Is Florida Splendid China closing its doors? members of CACCP visit the exhibits and check on the rumors of the park closing. ... The commies did it. Did irate communists throw a monkey wrench into sale talk at Splendid China? October (14) Demonstration to commemorate 51st Anniversary of takeover of Eastern Turkestan. Where in the world is Yang? The Splendid China theme park opened near Orlando seven years ago as a low-key alternative to Universal Studios or Disney's Magic Kingdom. Would it last? Well, Splendid China's still around. Barely. But its president, Sunny Yang, recently was sent back to mainland China and reportedly is under house arrest amid allegations of financial mismanagement. Lawyers for Massachusetts-based Brookhill LLC, a company seeking to buy Splendid China from an arm of China's government, still hope to bring Yang back for a deposition. 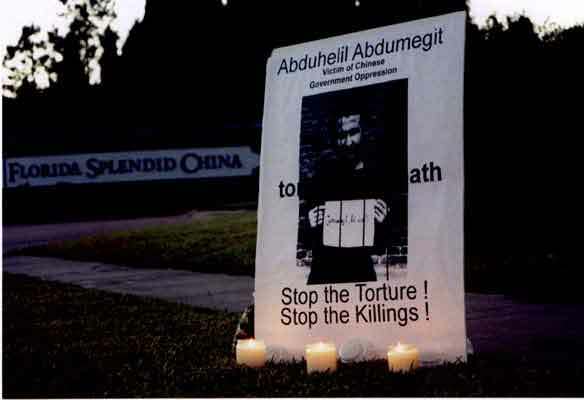 (12) Candlelight Vigil in Memory of Abduhelil Abdumegit. December (16) Protest demonstration to commemorate the 7th Anniversary of the opening of Florida Splendid China. One good sign: They're mowing the lawn again at China-owned attraction. March (11) Protest Demonstration to commemorate 42nd anniversary of Tibetan Uprising Day. April (28) Protest Demonstration to commemorate 54th anniversary of takeover of Inner Mongolia. 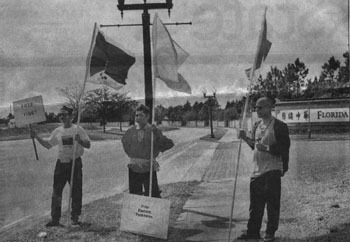 (2) Protest Demonstration to commemorate 12th anniversary of TianAnMen Square massacre. Seeking to generate interest in their homeland, 80 representatives from China will be in Kissimmee today as part of the China Culture & Travel Road Show. Just like mainland China, Splendid China is being Americanized. 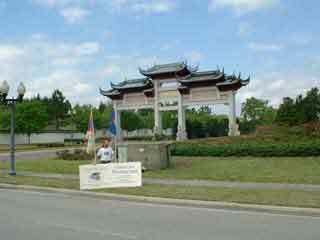 (25) Demonstration to greet visiting Chinese government officials. December (15) Protest Demonstration to commemorate 8th anniversary of the Grand Opening of Florida Splendid China. 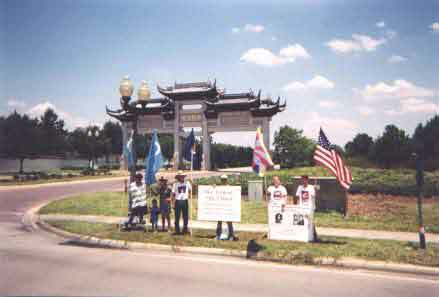 Uyghur American Association statement read in front of the East Turkestan exhibits at Florida Splendid China.